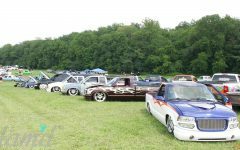 Those of us that were fortunate enough to grow up on the West Coast in the ’80s and ’90s during the “River Run” heyday will always carry the memories of great times, killer rides, and weekend debauchery with us for a lifetime and beyond. 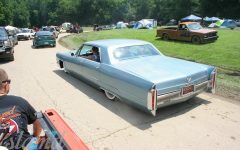 But those days aren’t completely extinct just yet! 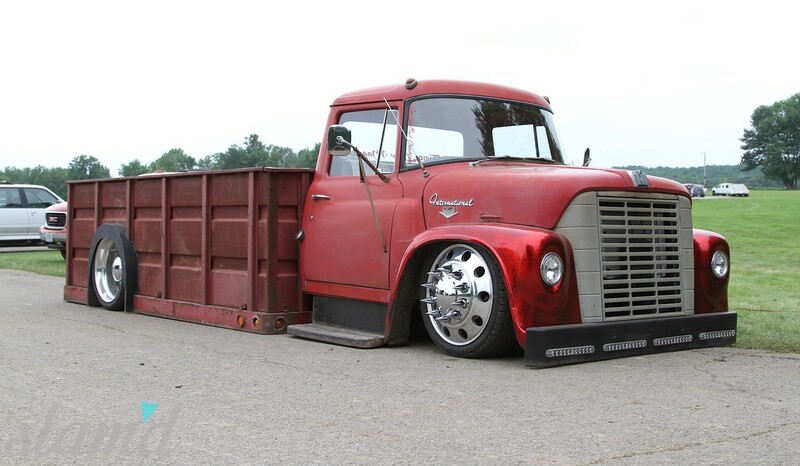 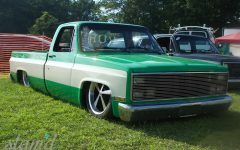 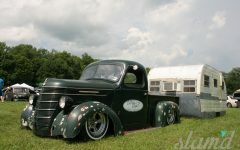 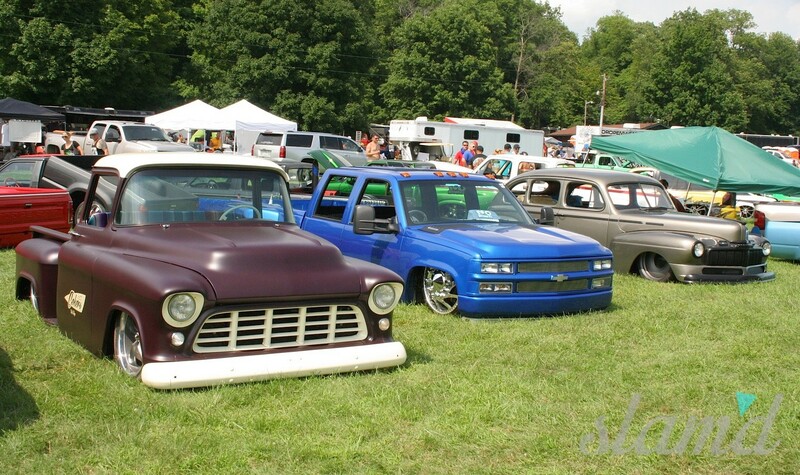 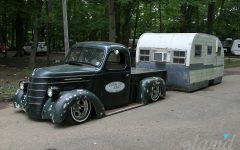 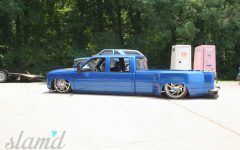 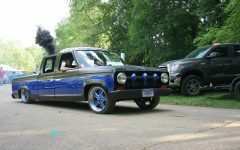 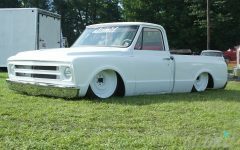 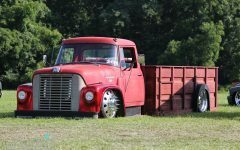 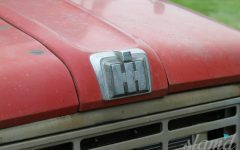 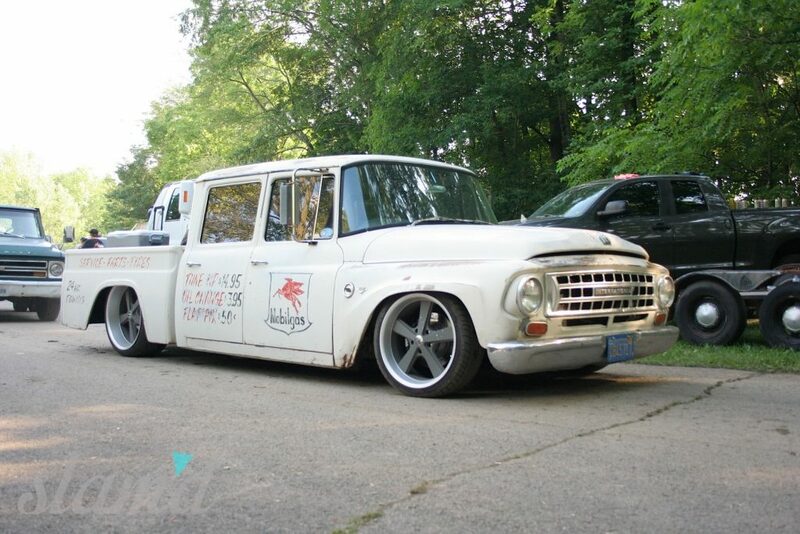 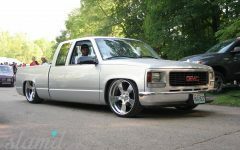 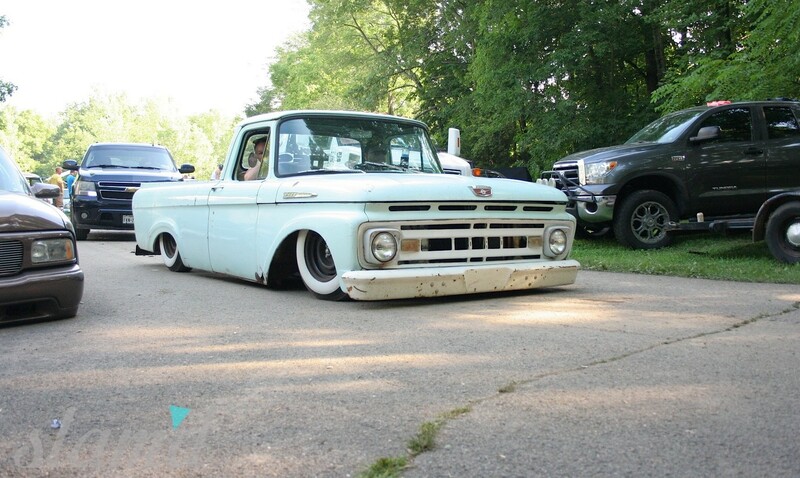 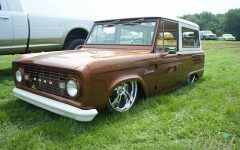 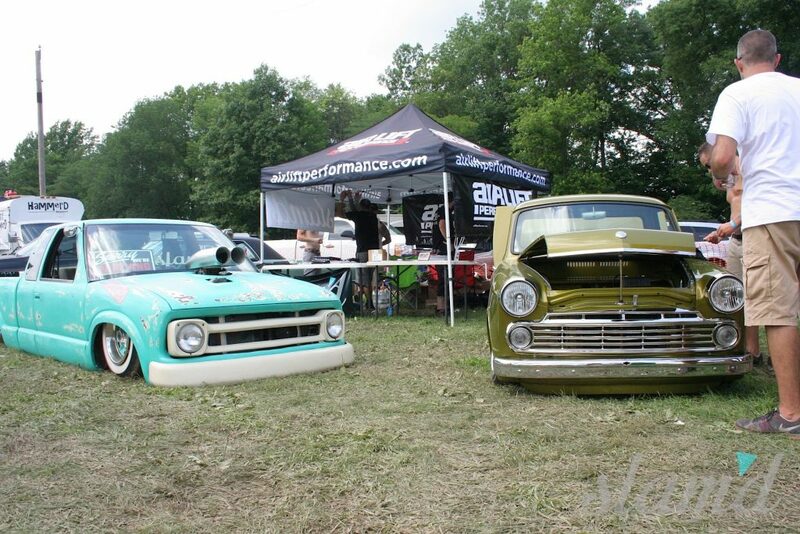 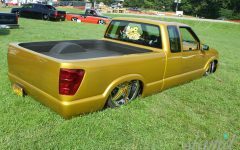 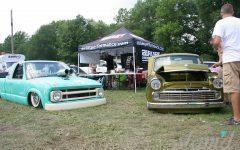 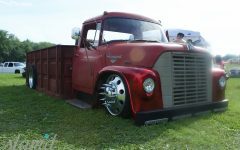 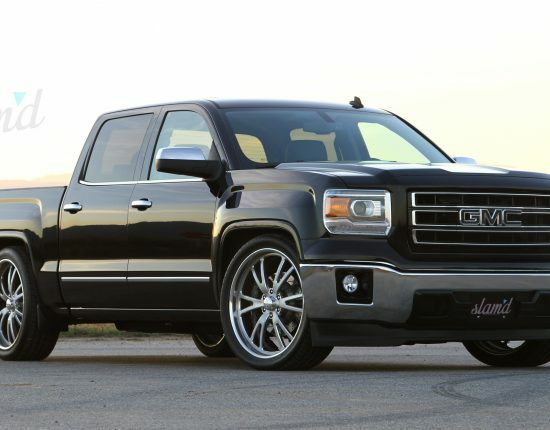 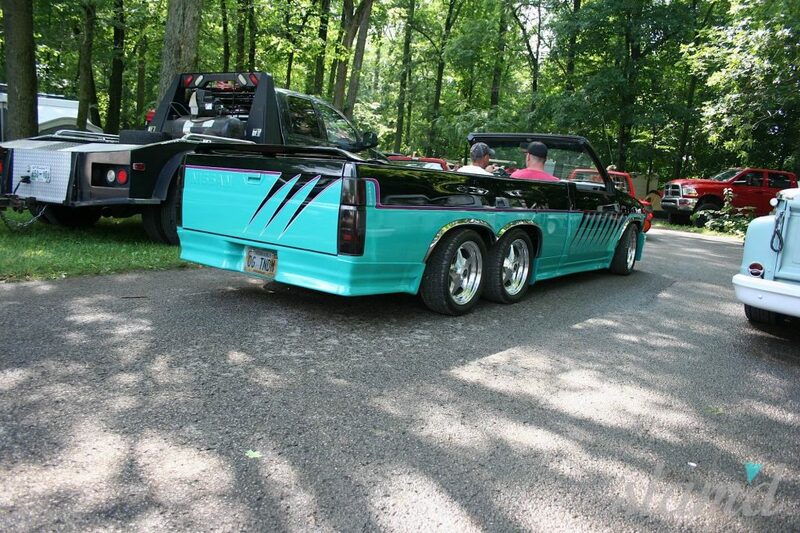 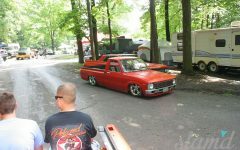 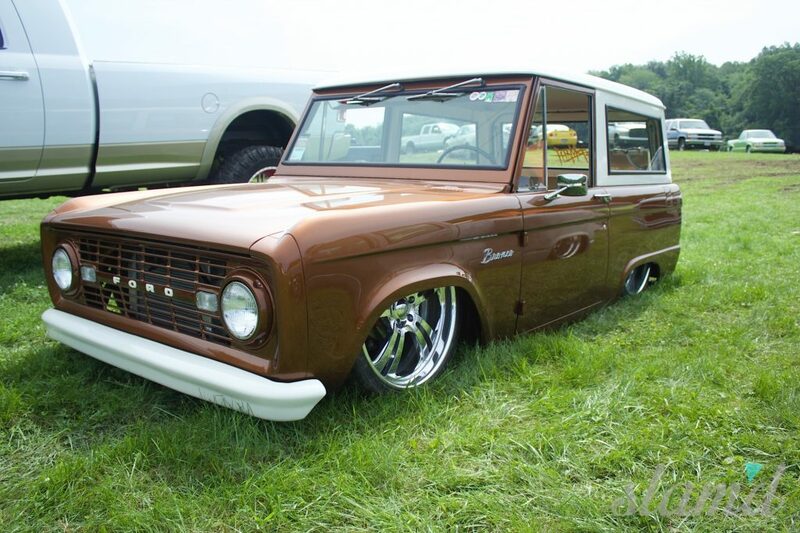 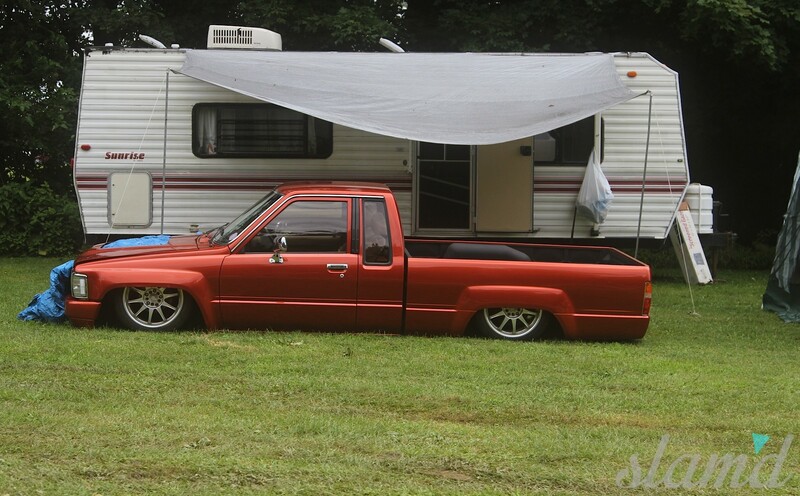 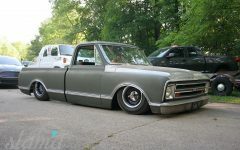 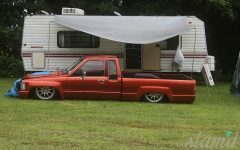 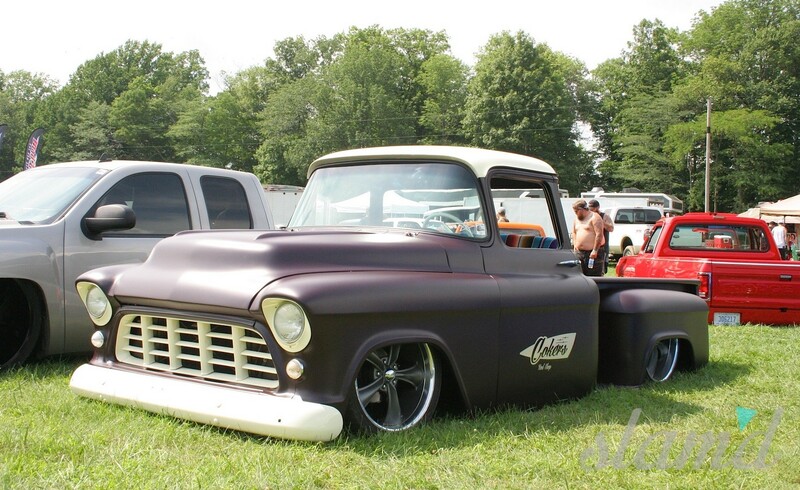 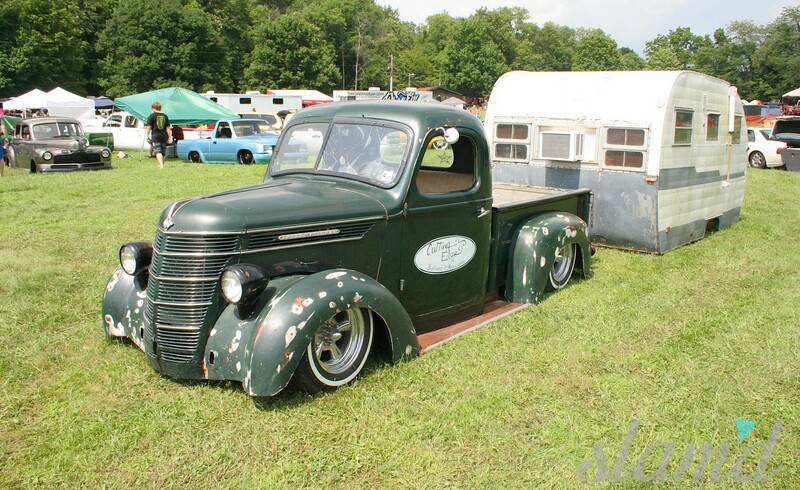 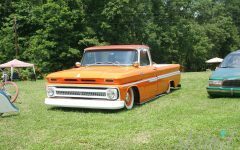 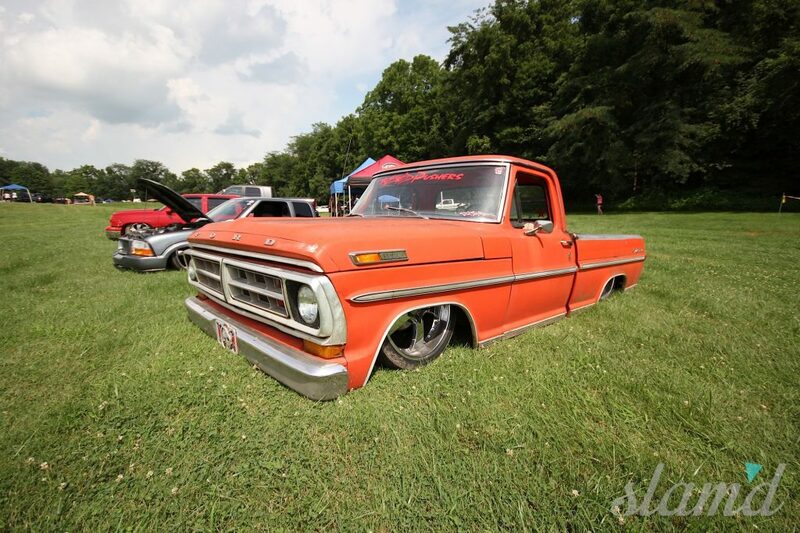 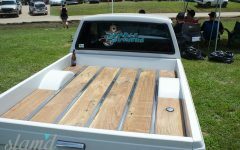 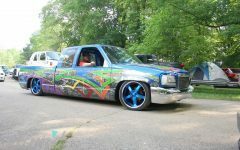 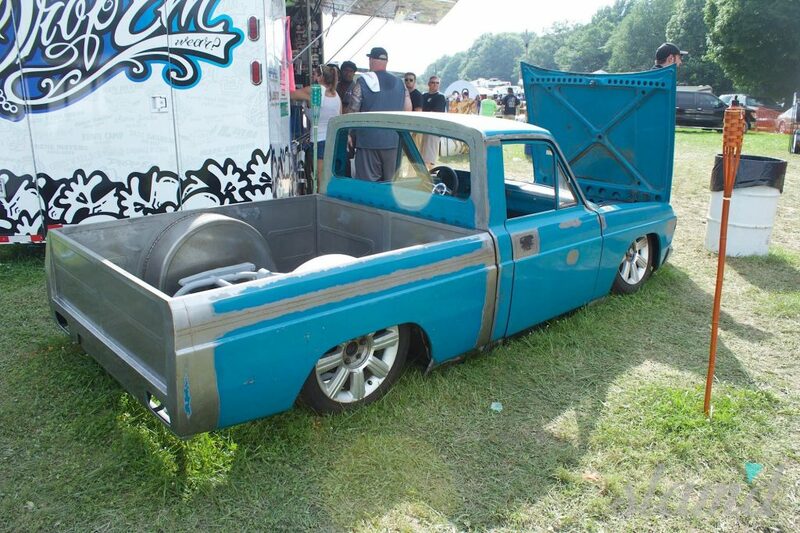 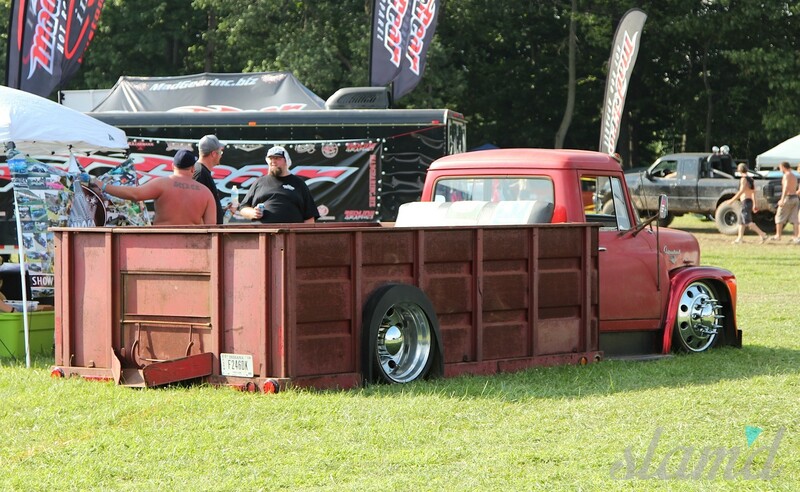 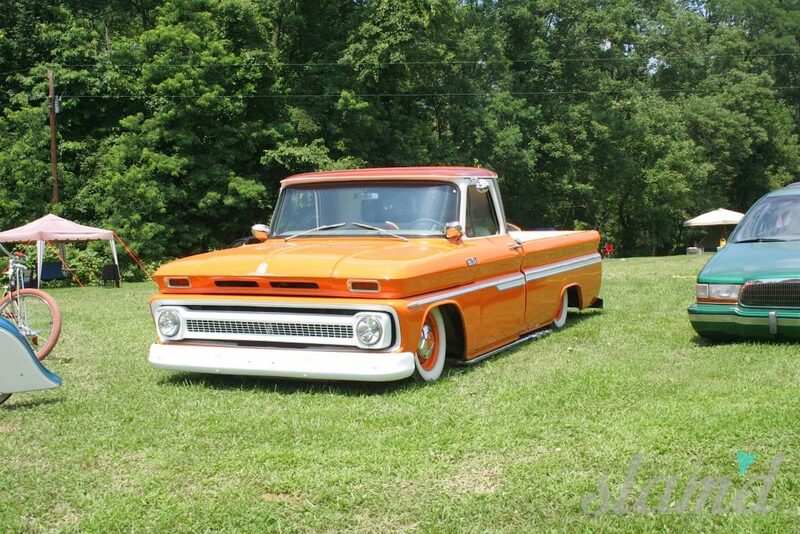 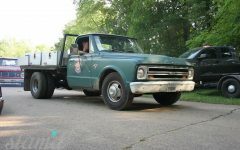 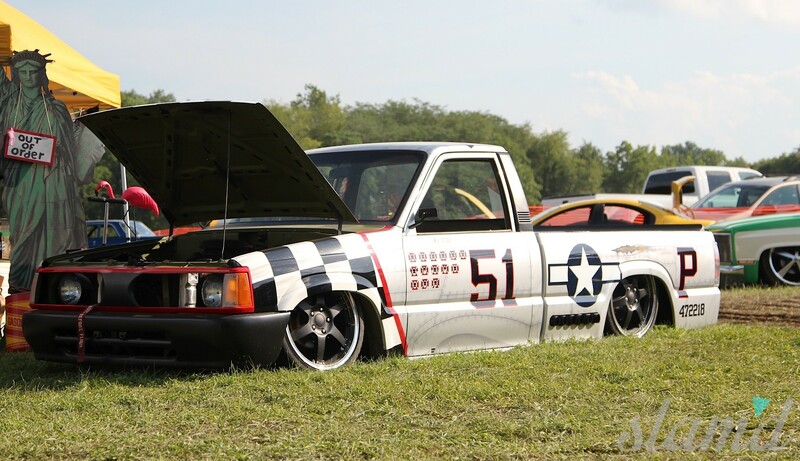 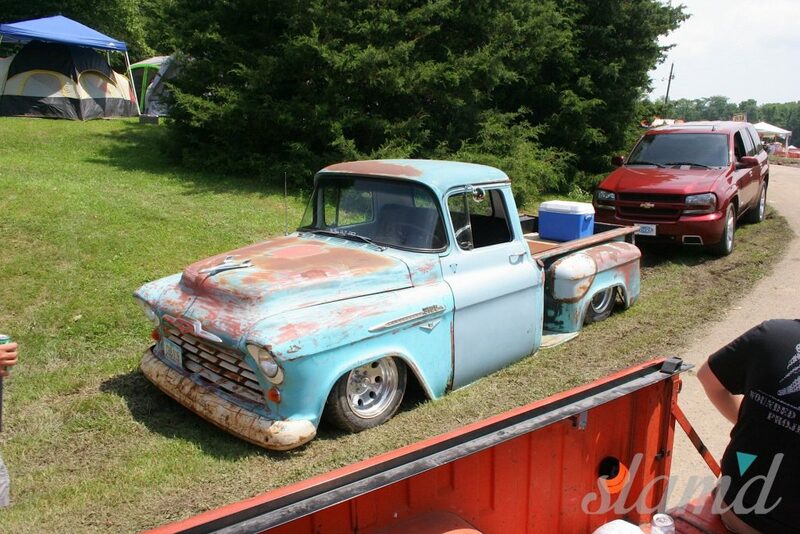 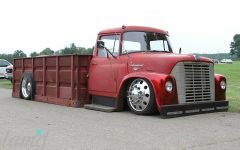 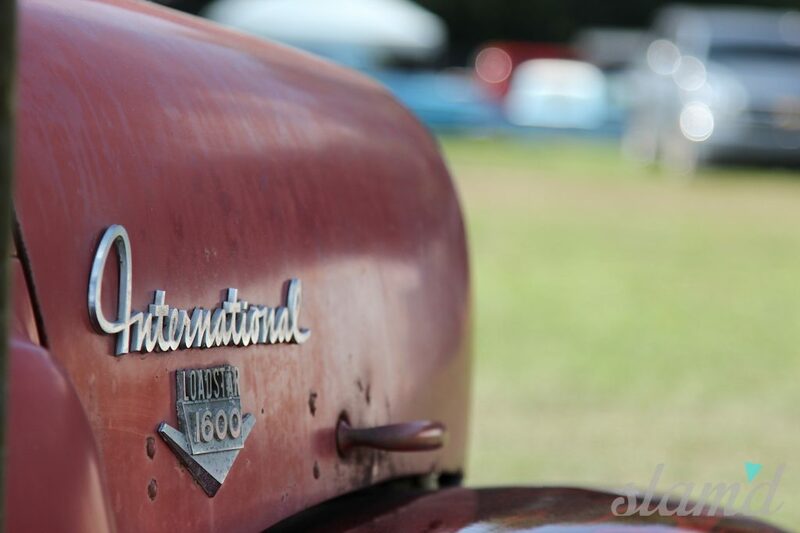 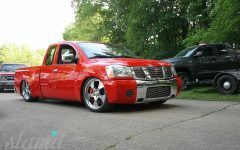 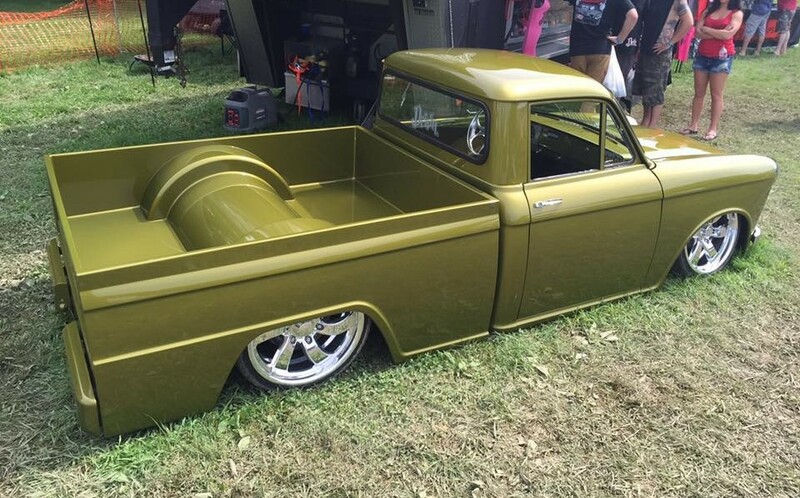 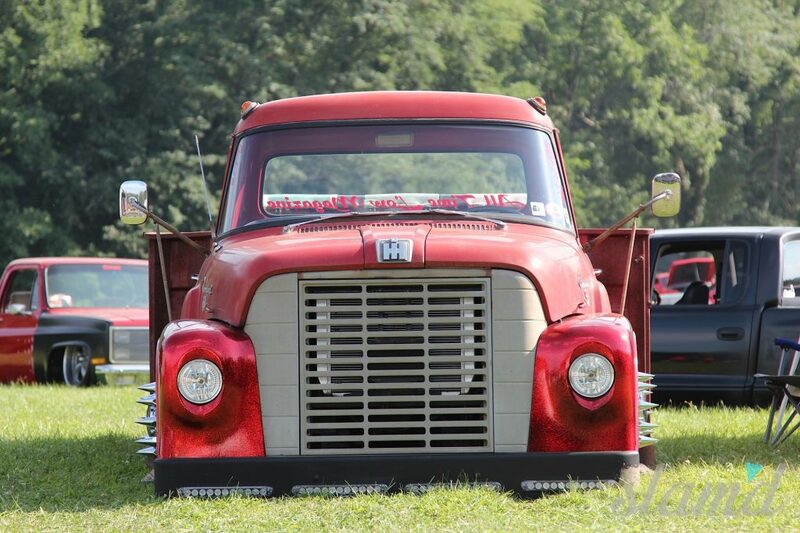 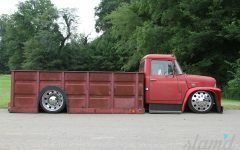 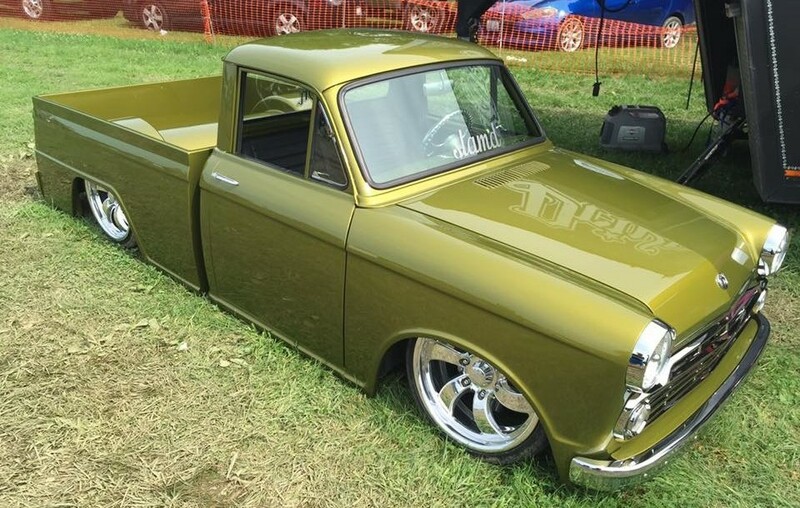 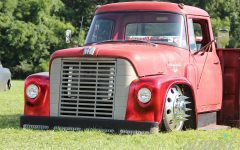 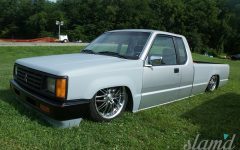 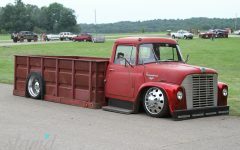 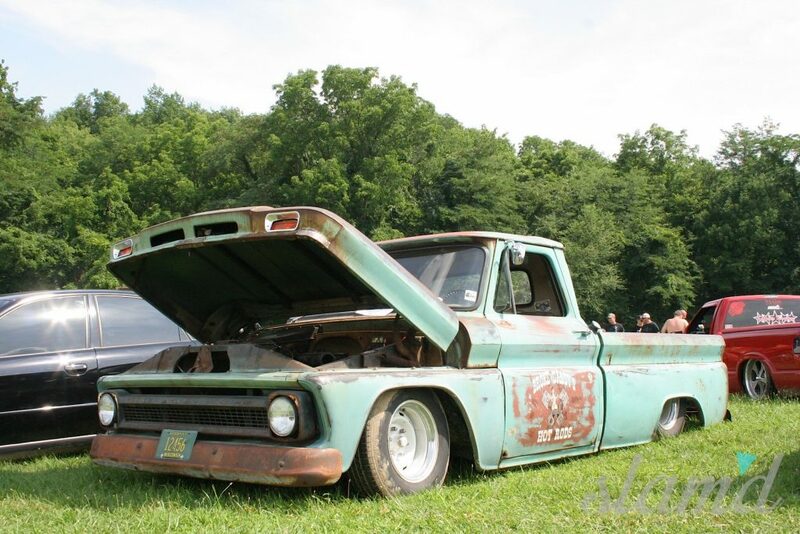 There are a handful of custom truck shows that are still hanging on to this old-school tradition and doing their part to keep these memories alive for the next generation. 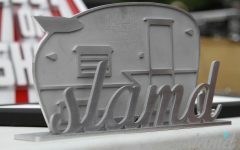 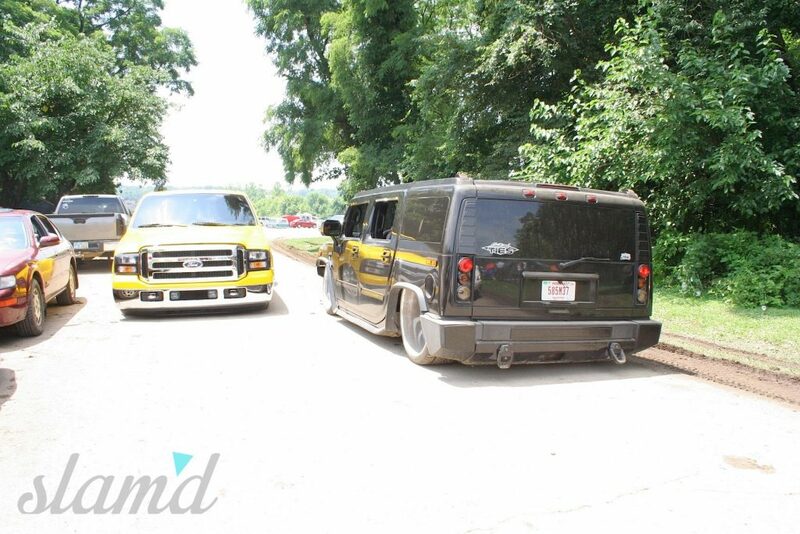 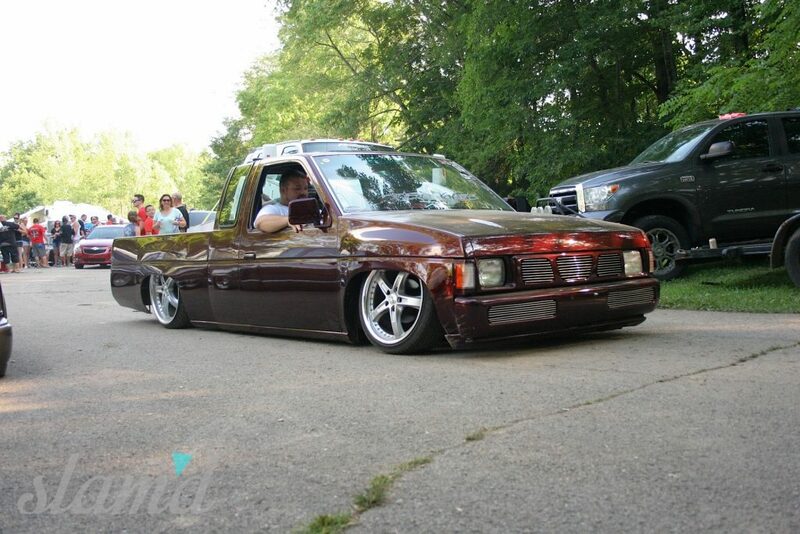 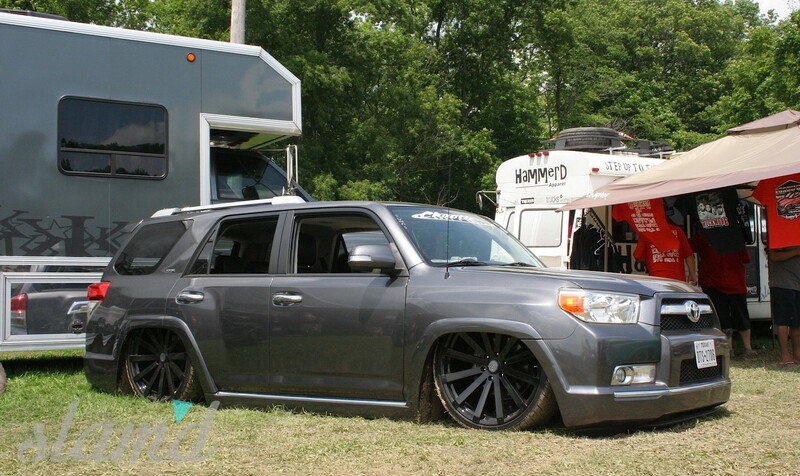 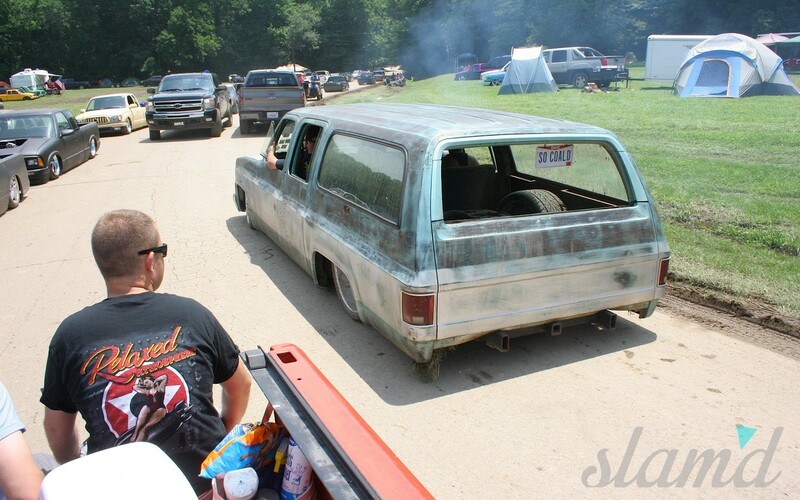 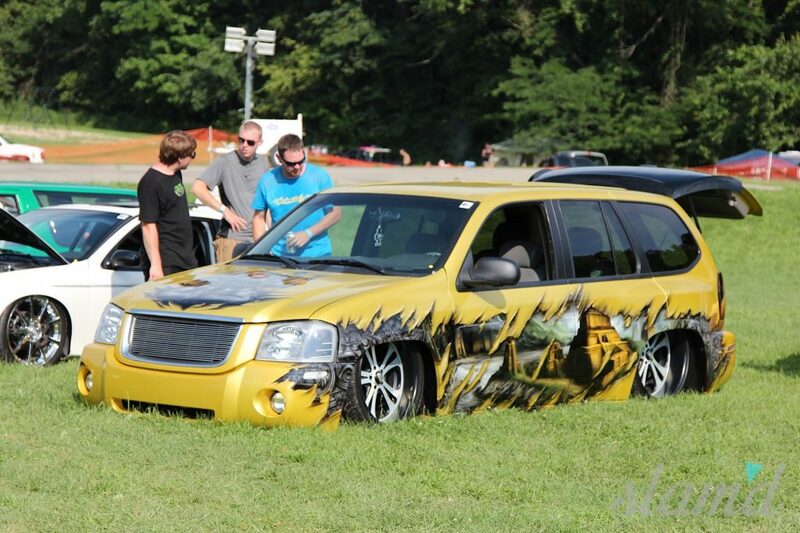 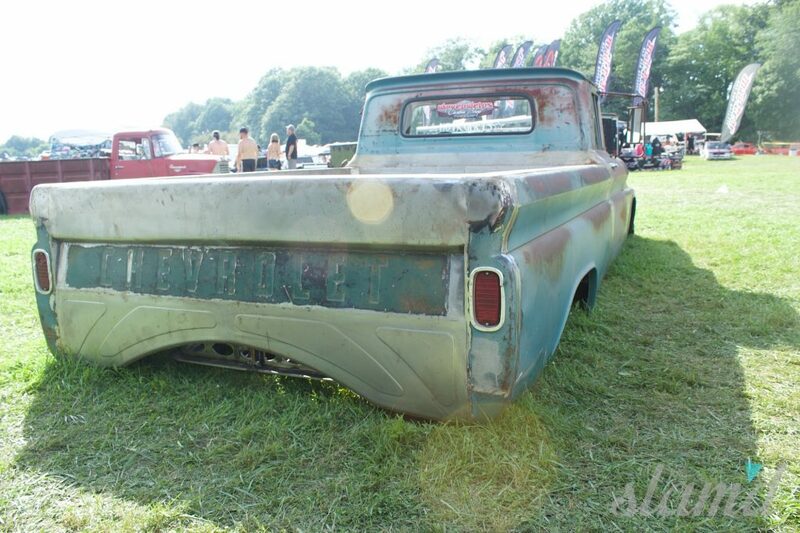 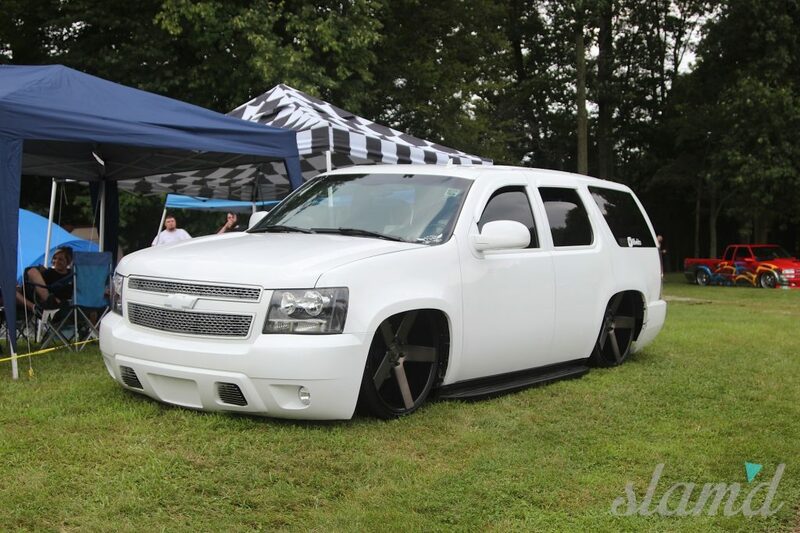 Recently we made the trip out to Waveland, Indiana to experience our Slam’d Mag 2014 Show of the Year firsthand. 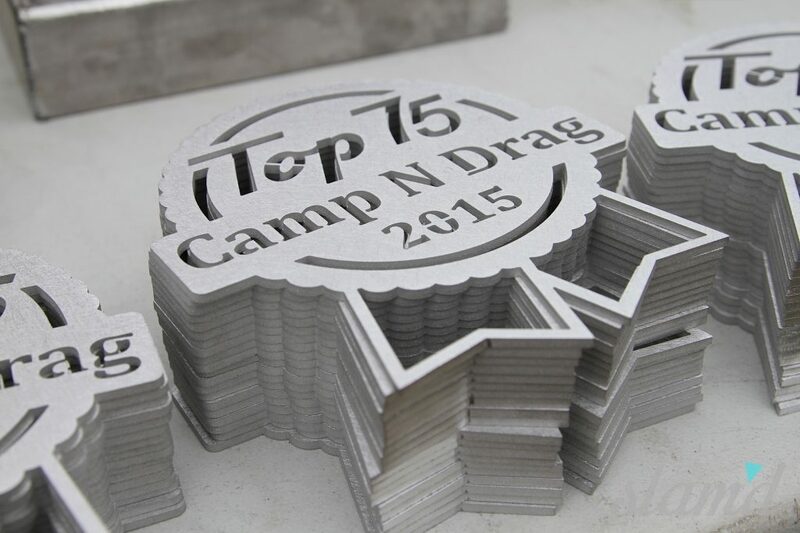 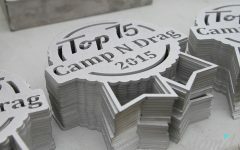 That’s right, there’s a reason why Camp-N-Drag was voted our 2014 Show of the Year and we had to make sure that it lived up to this title in person. 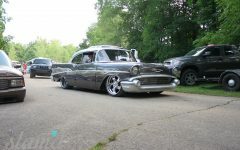 So we hoped a plane to Michigan to visit with our buds over at Air Lift Performance and Halls Hot Rods before hitching a ride down to the campgrounds in Waveland, Indiana. 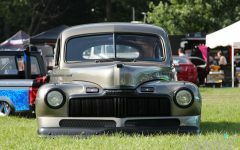 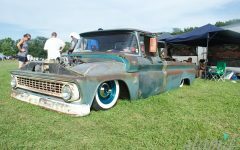 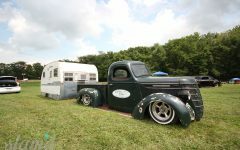 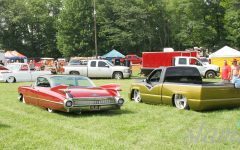 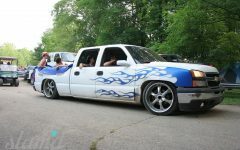 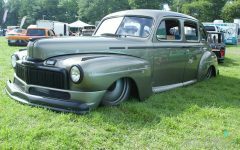 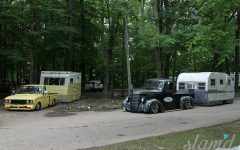 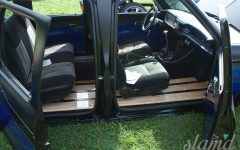 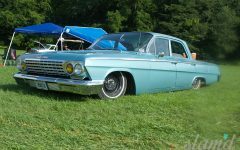 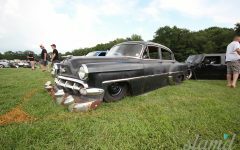 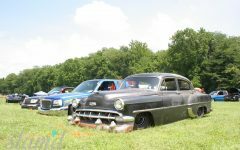 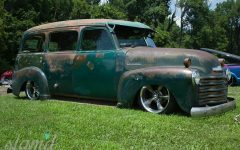 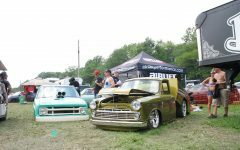 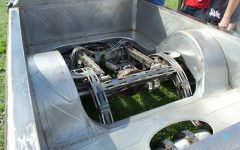 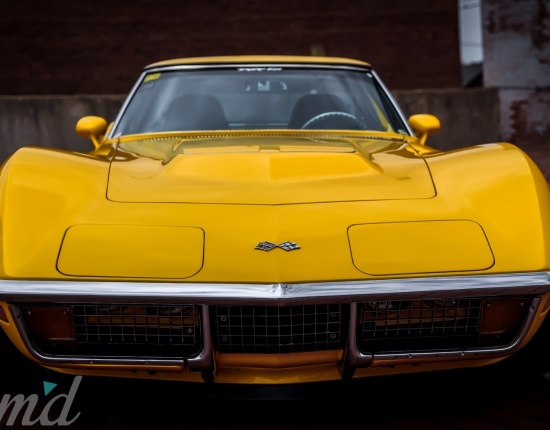 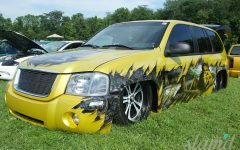 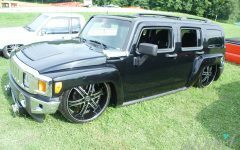 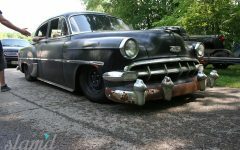 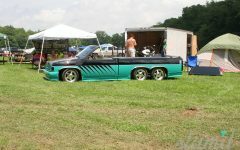 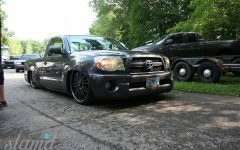 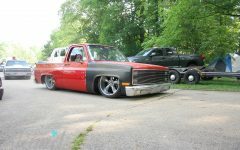 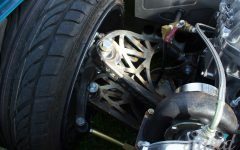 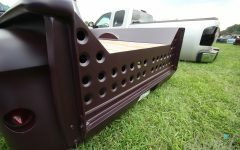 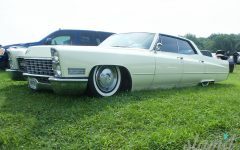 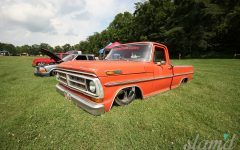 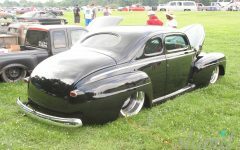 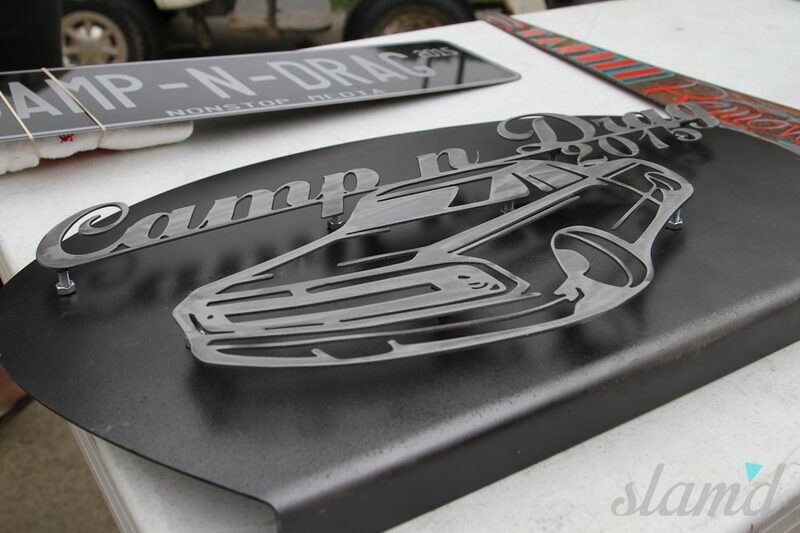 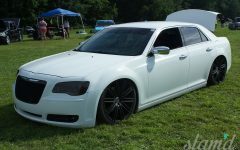 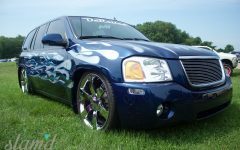 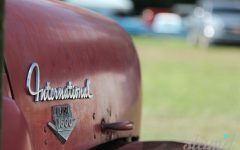 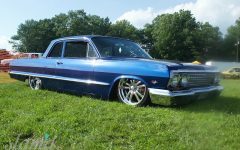 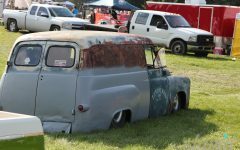 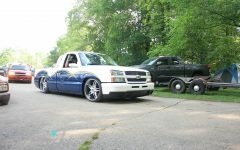 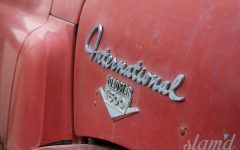 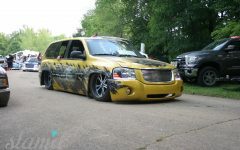 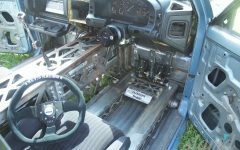 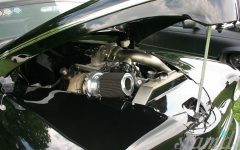 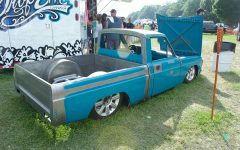 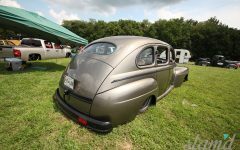 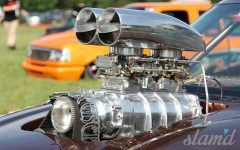 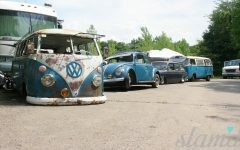 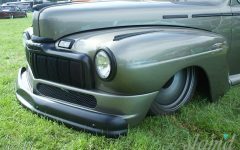 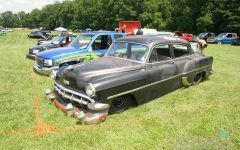 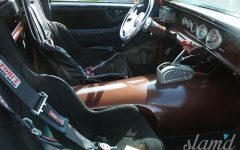 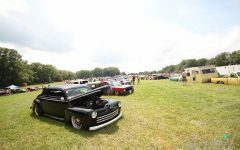 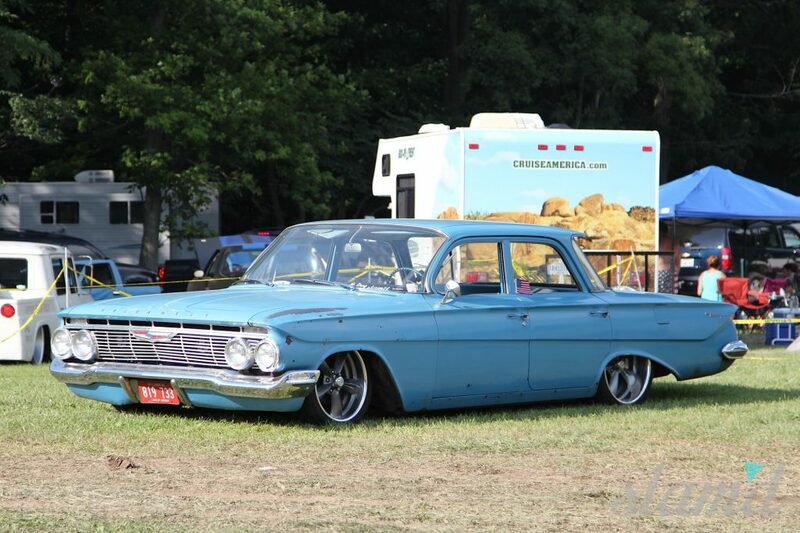 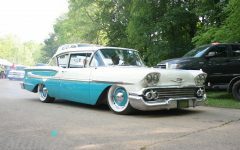 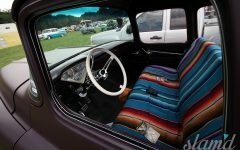 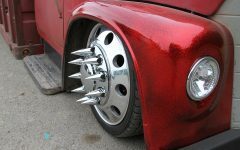 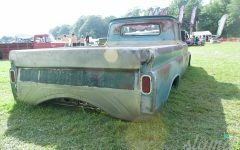 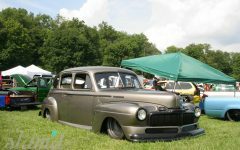 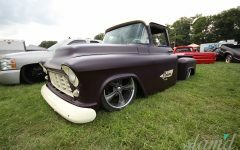 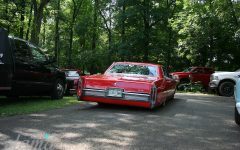 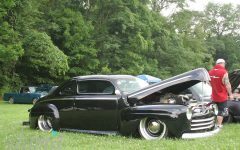 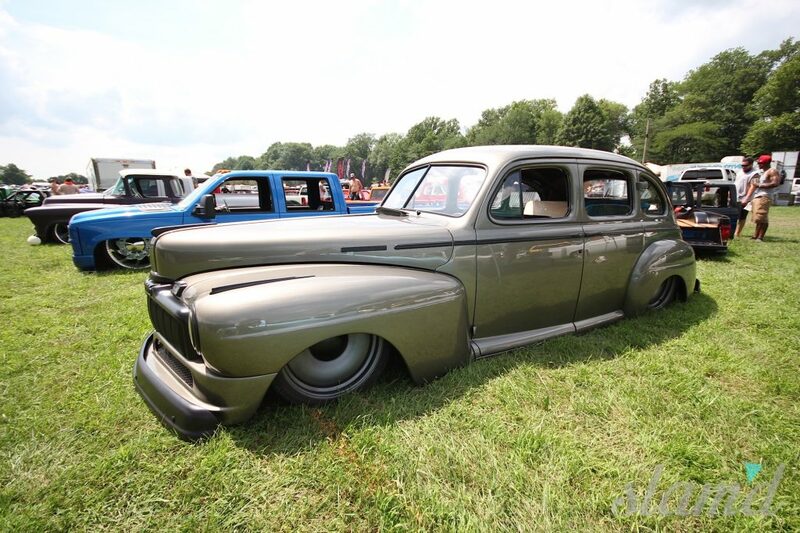 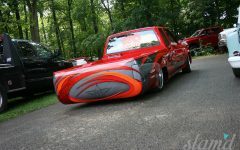 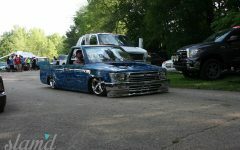 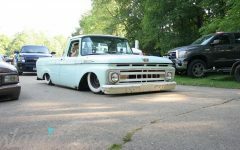 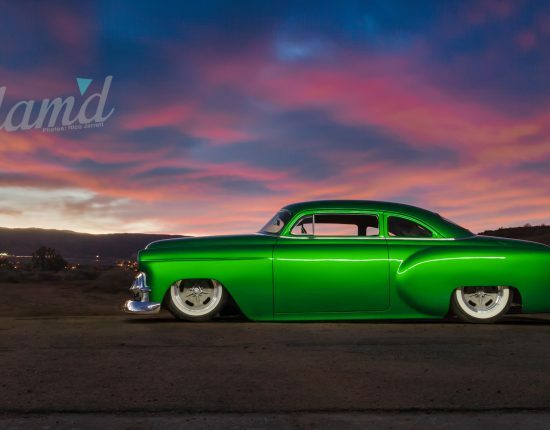 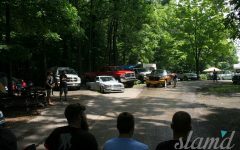 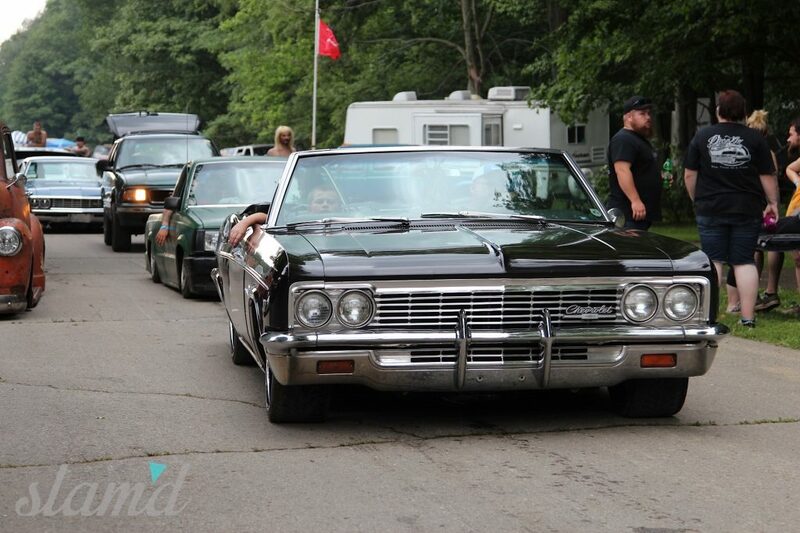 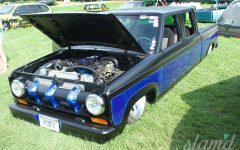 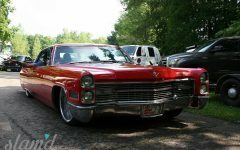 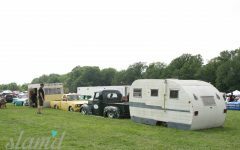 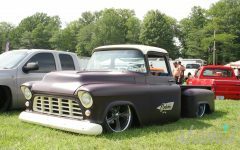 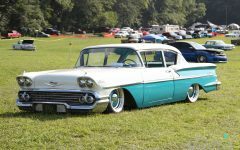 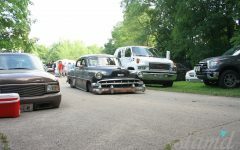 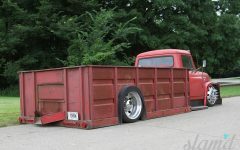 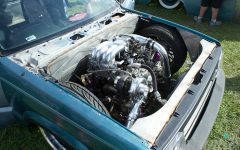 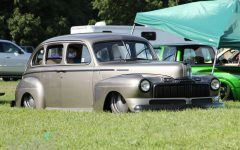 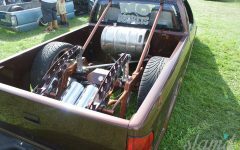 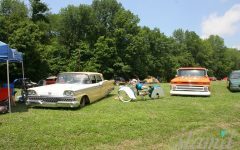 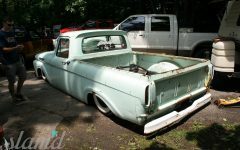 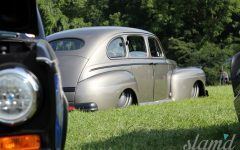 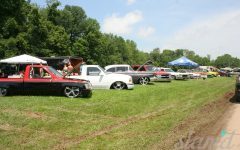 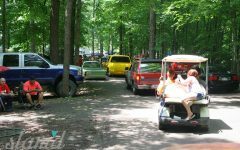 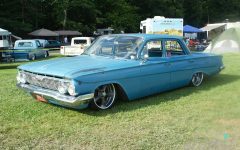 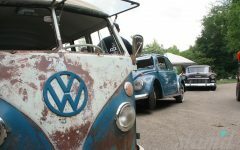 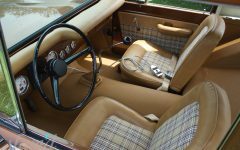 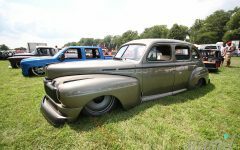 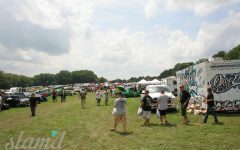 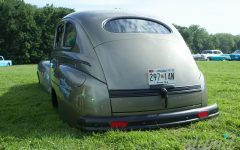 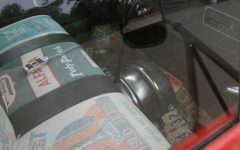 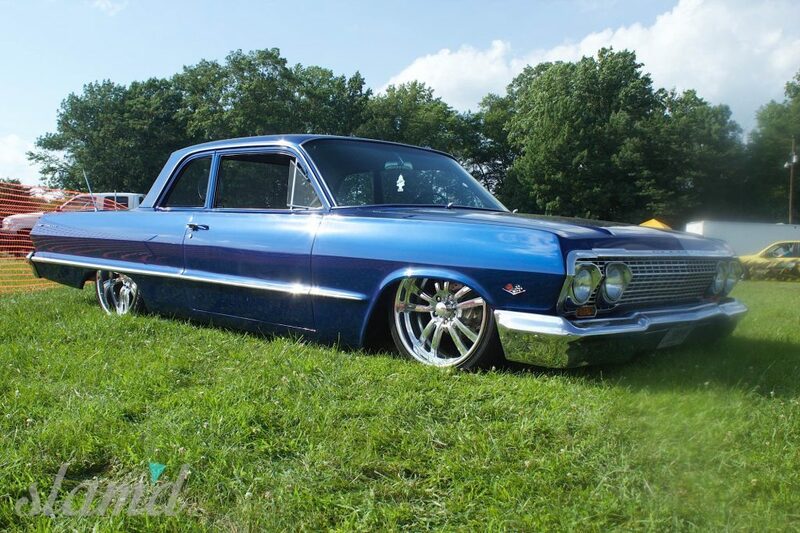 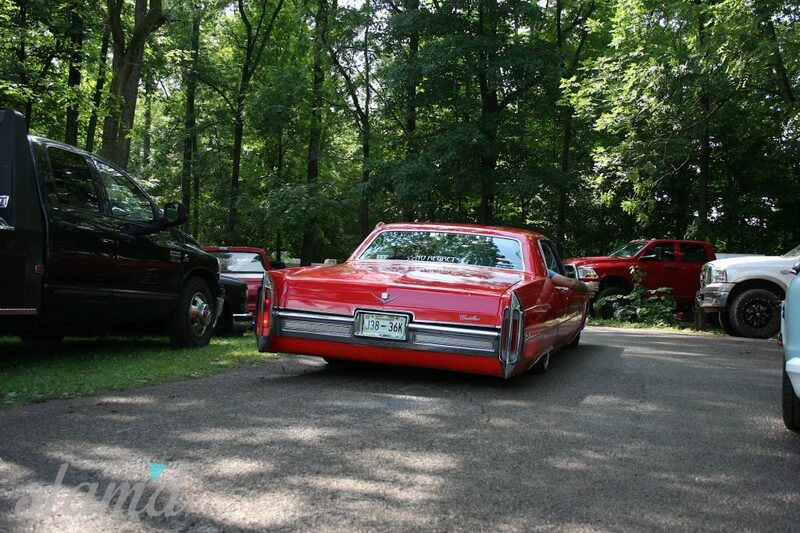 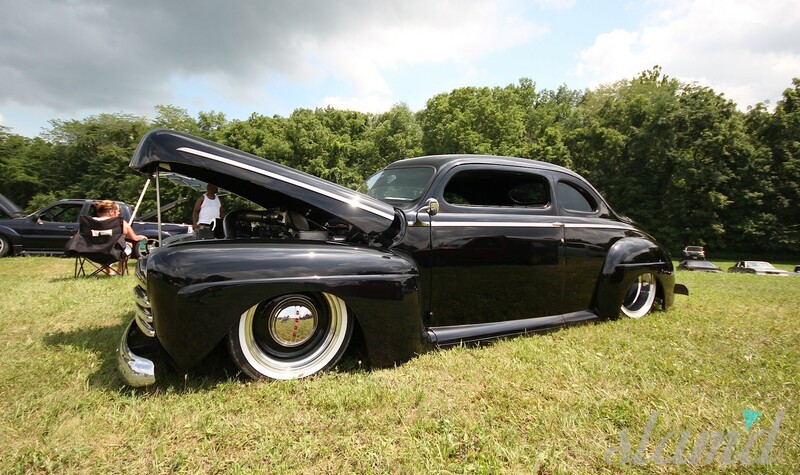 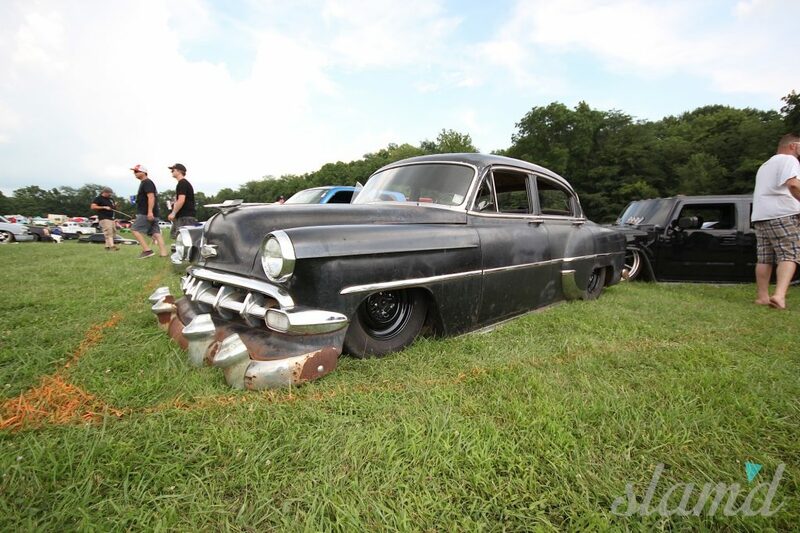 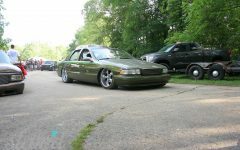 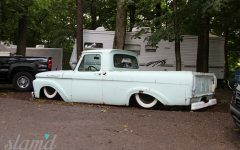 Each year the anticipation leading up to this show is unmatched, with tons of builds being cranked on in garages and shops across the country for that “Camp-N-Drag crunch” which we experienced a bit of firsthand. 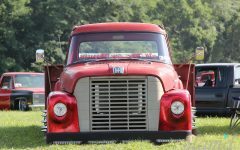 This is one of those shows that is worth the trip no matter where you’re from, with trucks cruising in from as far as both coasts; Cali, Florida, the North East and everything in between. 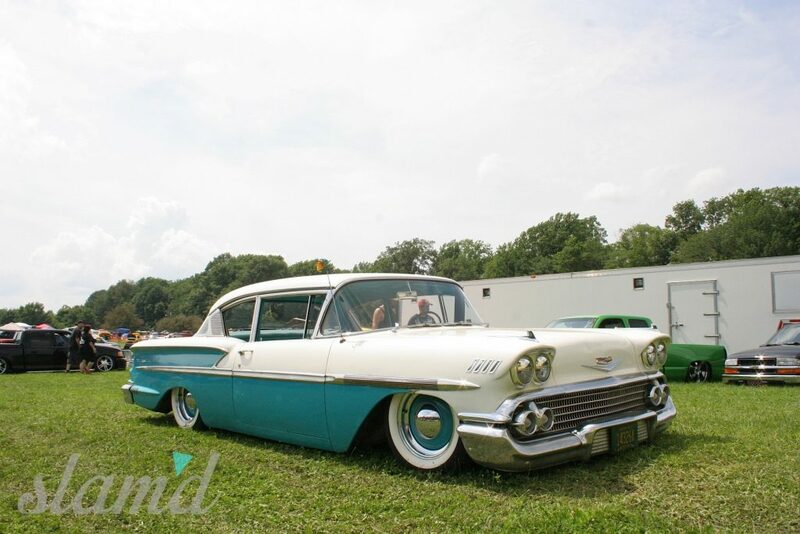 After getting a taste of this show, there is definitely a particular magic that you don’t want to miss. 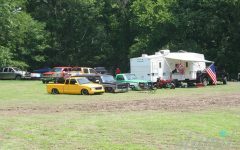 It’s hard to describe but even with the crap weather the first night (besides for a hand-full of ignorant locals) there was a camaraderie among the show goers where it just seemed as if everyone you came across were your life-long friends. 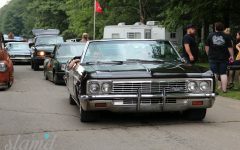 For the most part everyone was super respectful and very helpful (we may or may not have run out of gas and had to be pushed while our “one-legged” vet friend sat in the back seat, but that’s another story for another time ha ha). 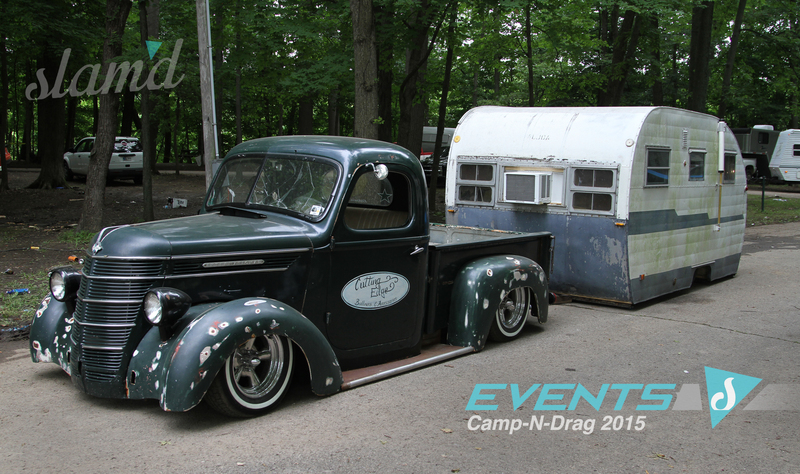 The cruising around the camp grounds was definitely a highlight and paired with the high-quality builds, custom camper combos, and unforgettable nightlife you will leave the show knowing that you have just added another must-hit show to your yearly roster. 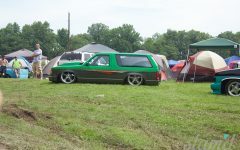 People setup camps as early as Wednesday and post up to claim their spot early. 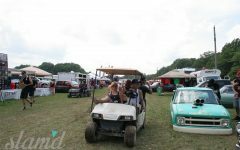 The layout of the show grounds is perfect to setup your tent and club area while scoring a spot close to the “cruise loop” so you either have easy access to join in on the fun or can post up in your chair and take in the sights and sounds as the party strolls on by. 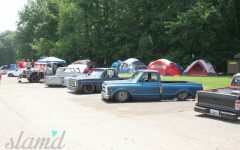 In true camp out fashion, everyone comes prepared to spend the entire weekend at the show, grilling burgers and enjoying plenty of cold ones with their buddies and even sharing with passersby. 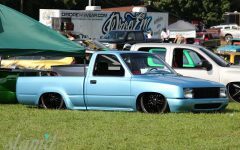 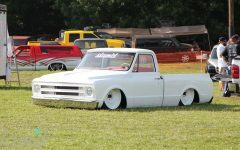 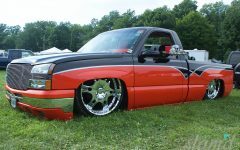 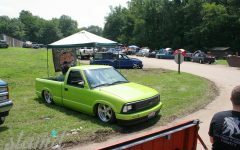 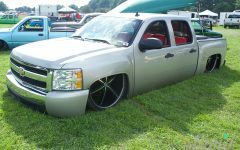 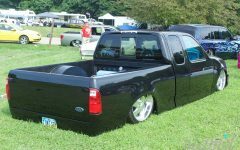 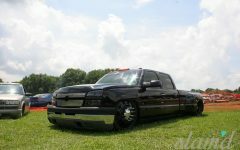 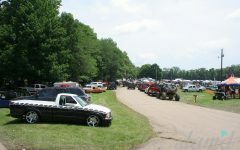 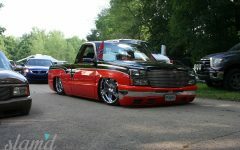 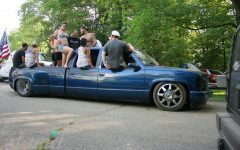 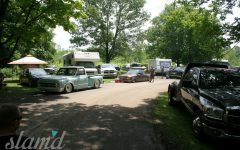 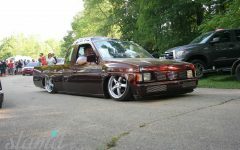 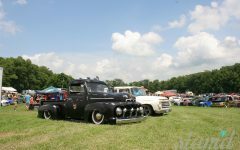 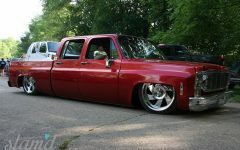 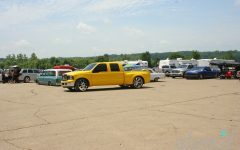 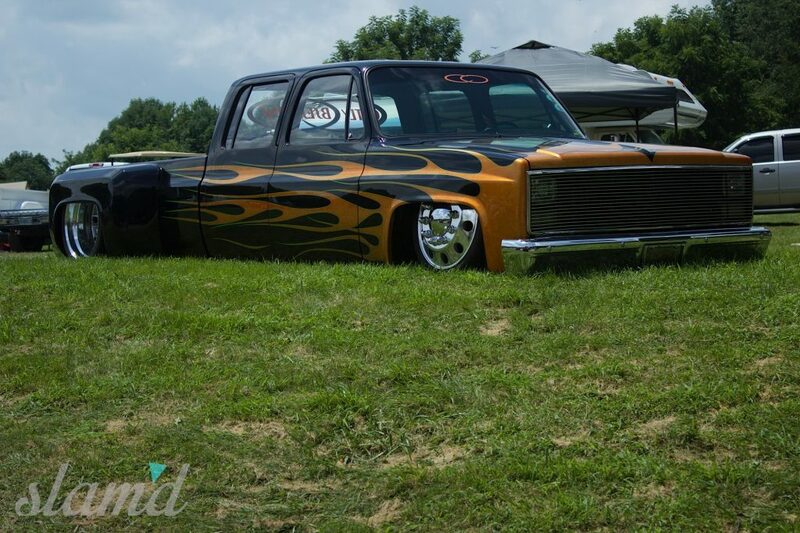 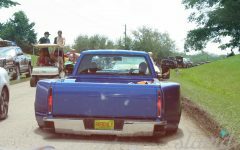 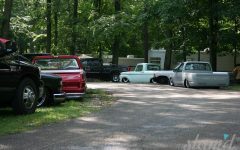 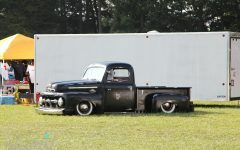 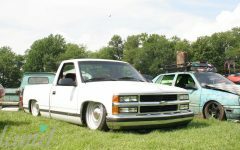 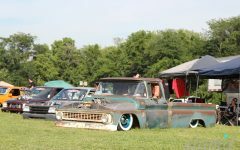 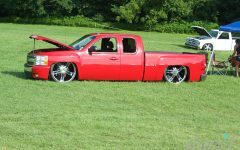 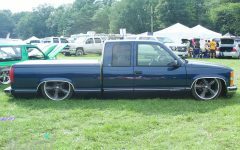 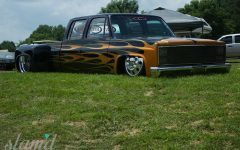 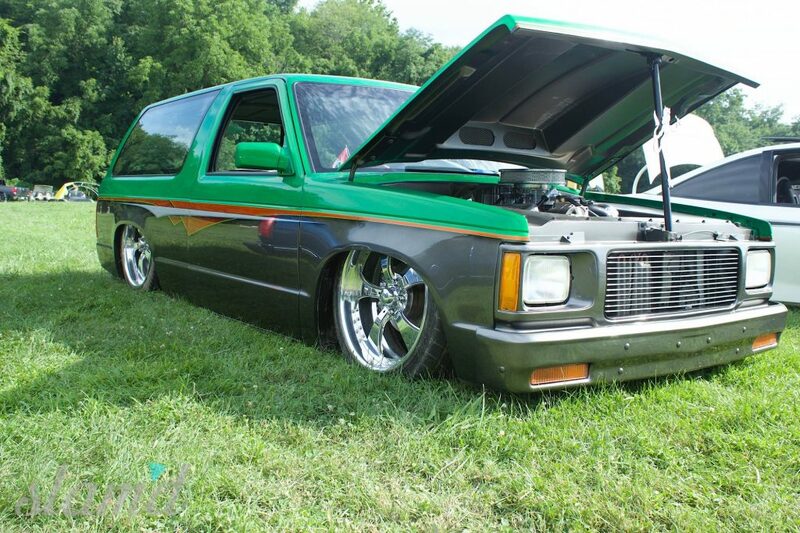 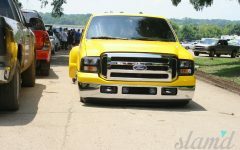 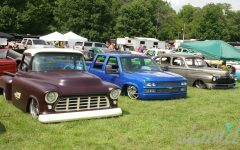 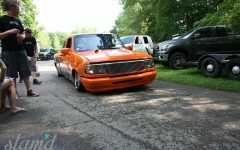 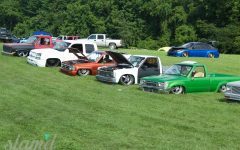 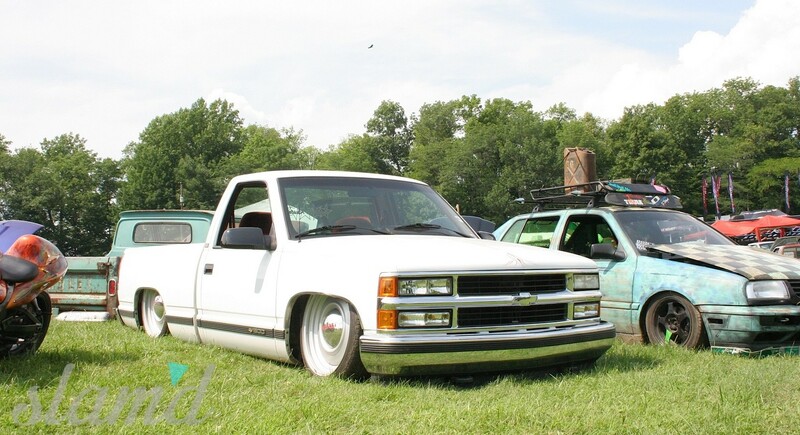 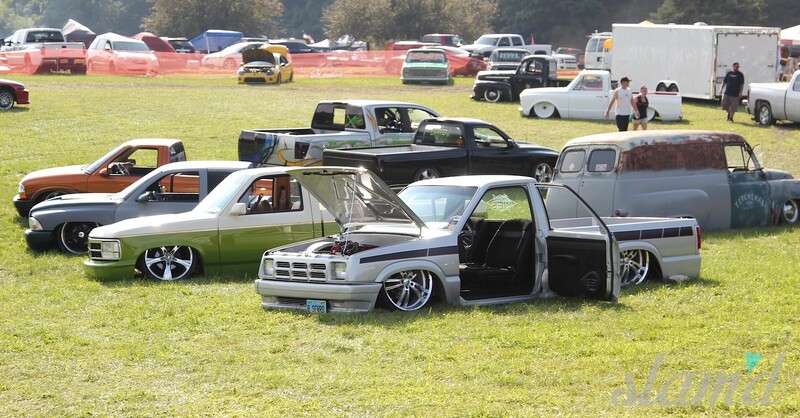 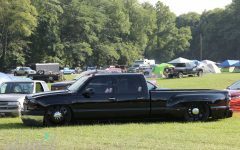 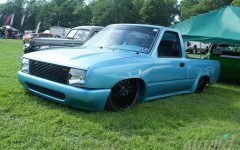 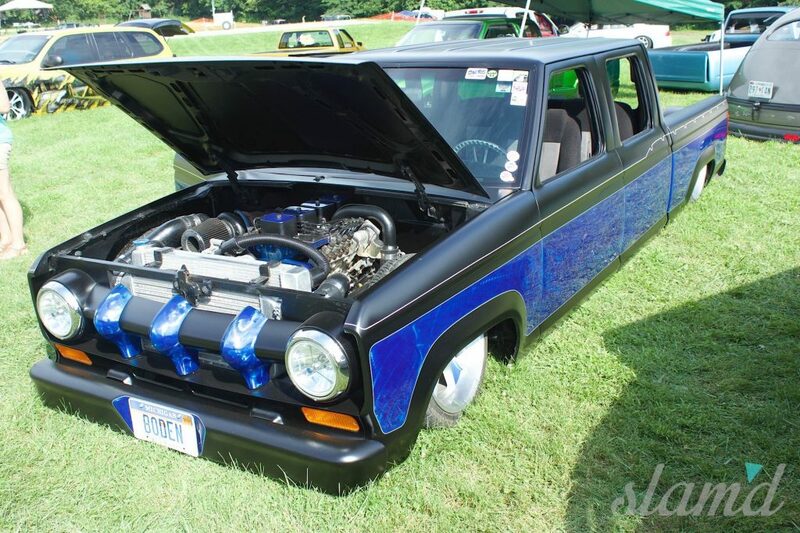 All in all this is one hell of an event, and with plenty of customs, classics, and late-models it’s not just a “truck show” anymore and there is a ton of diversity to keep even the pickiest onlookers intrigued. 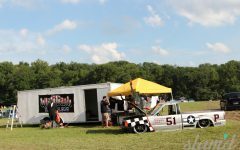 The Balistik crew does a hell of a job putting on this show and keeping organized chaos in check throughout the weekend. 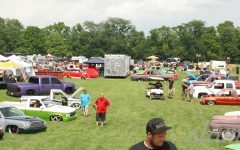 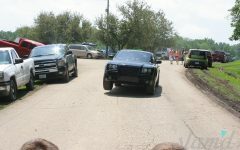 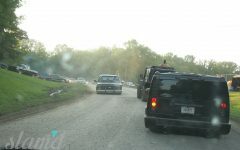 The numbers continue to climb and this year brought in more than 500 vehicle registrations and 3,500 spectators, even with the threatening weather reports leading up to the weekend. 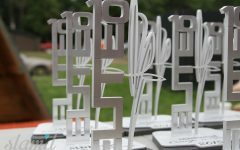 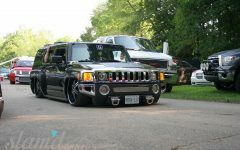 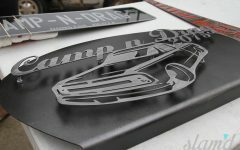 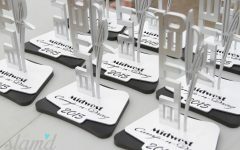 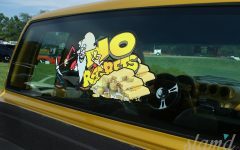 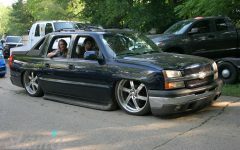 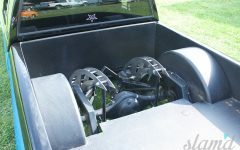 And to top it off, the crew has a host of custom trophies going to the top rides in attendance. 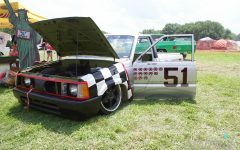 This year the coveted “Best of Show” and Slam’d Choice awards went to Joe Contenta with the debut of his stunning garage-built Datsun 320, congrats buddy, well deserved! 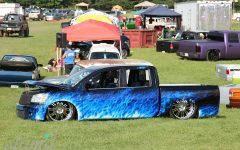 If you haven’t yet, make sure you watch the video below and check out our largest photo gallery to date!